All File Email Address Extractor v2.3 is a best email address extractor tool to extract email address from PDF,MS WORD(DOC/DOCX),MS EXCEL(XLS, XLSX),CSV,RTF,EML,DBX,WSDEML,MSF,TEXT,XML,HTML and other any document file format. All File Email Address Extractor v2.3 can process thousand of files in batch process and fast email address extractor for any document file format. 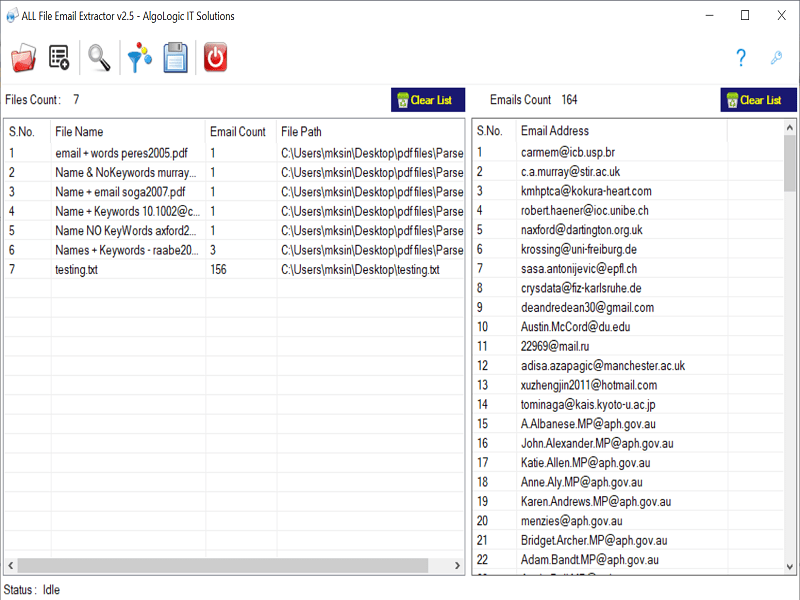 All File Email Extractor v2.3 works for all version of PDF, MS WORD (DOC, DOCX) and Excel Files(XLS, XLSX). It not required to installed other software like Adobe Acrobat software to extract email address from PDF Files.All File Email Address Extractor v2.3 have excellent features to give you only valid email address list and all email addressed can be exported to EXCEL, CSV and TXT file format. Recent Changes: Support for Excel Files of all version, MSF, RTF, WSDEML, EML files.